It is, or at least was, notoriously grim up north, or so films and literature have frequently assured us big soft lads from down south. That tales of northern hardship have been the subject of parody over the years should not lessen their validity and lesson-teaching social importance. The conditions in which factory and mine workers and their families lived and worked in order to make corpulent industrialists wealthier than any man has a need to be were a disgrace, creating a cycle of poverty in which entire communities became effectively trapped. 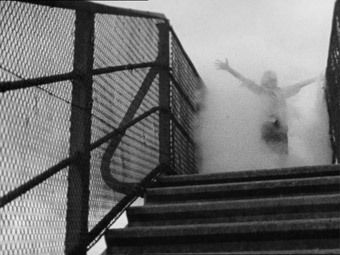 If you're not familiar with the work of Scottish filmmaker Bill Douglas then this is likely because you're either still retrospectively discovering the wonders of non-mainstream cinema or you have no interest in films that don't play at the local multiplex. If it's the latter then you're probably on the wrong site. You may well have heard of Douglas but never caught any his films, know that he only made four, and only one of those was feature length. To watch his entire output would take less than six hours of your time. Our very own Jean Vigo, you might argue.But tracking them down has not always been easy – TV screenings of his films have been rare and you're unlikely to have spotted the videos in your local Woolworths. Which is all a little unjust for a man regarded as one of the most unique and visionary filmmakers in British cinema. 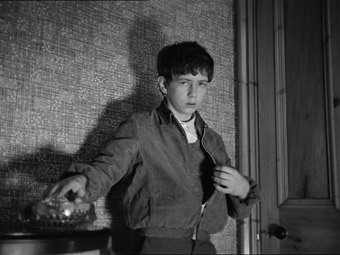 As their titles indicate, the three films that comprise The Bill Douglas Trilogy are autobiographical works that collectively paint a portrait of Douglas's own harsh childhood and adolescence. Set in an unnamed Scottish mining town in 1945 during the last days of WW2, My Childhood introduces us to young Jamie, a dirt-faced, raggedly dressed stand-in for Douglas who shares a house with his half-brother Tommy and ageing grandmother, who has taken on the task of raising the pair. That he and Tommy share the same mother but different fathers – both now absent and despised by the grandmother – is something both we and he discover during the course of the film. The cause of the illness that has put the boy's mother in an asylum, unable to recognise or react to those around her, is left for us to speculate. Emotionally disconnected from his schooling and the other local children, Jamie has struck up a friendship with a German POW named Helmuth who works the local fields, a relationship that increasingly casts Helmuth in the role of surrogate father. When the war ends and Helmuth returns home to Germany, history seems to repeat itself for Jamie as another father figure deserts him. His real father, meanwhile, lives just a few houses away, shielded and controlled by his possessive mother. My Ain Folk sees Tommy and Jamie separated following the death of their grandmother – Tommy is hauled off to a children's home by the authorities while Jamie is taken in by his father, where he receives a hostile reception from the over-protective mother. Enraged by the affair her son is having with their neighbour, her own mental health begins to deteriorate and the grandfather starts to exhibit suicidal tendancies. Jamie's unhappiness continues in My Way Home, where his boarding school discontentment is disrupted when he is taken home by his father, whose wife and son react with hostility to this young intruder and are scornful of his artistic aspirations. Unable to make peace with himself or those around him either at home or school, Jamie ends up on the streets and is cut off from his past when he discovers that his remaining family have all moved away. Called up for national service, he joins the RAF and is stationed in Egypt, where he meets the educated Robert and starts a friendship that could be set to change his life. If you're thinking that this all sounds a bit bleak then you should know also that dialogue is kept to a minimum, the camera is largely static, and shots are sometimes held for longer than would normally be expected. Oh yes, and all three films are in black and white, emphasising the colourless nature of the setting and lives lived within it. But don't be put off in any way by this, as rarely if ever has such hardship, seeming hopelessness and social isolation been captured with such extraordinary cinematic poetry. OK, I need to pause a second here and qualify the use of that word. You know the one. Poetry is a term that can be too glibly applied to non-narrative cinema, and as a result can be interpreted by the unsympathetic as an excuse for weak storytelling or underdeveloped characters. I've used it myself a fair few times, but always with the knowledge that no other word will adequately suffice. Great poetry may address important truths or explore the indefinable in ourselves, but what makes it truly great is the manner in which it is written, the beauty of the language and the selection and juxtaposition of words, the structure of the verse and the way it alludes to things that would be rendered obvious if addressed directly. It is this quality that defines the cinema of Bill Douglas. His subject matter, characters and settings are the material of social realism, but he tells his story with the language of a poet. Searching for a term that would sum this up, I was feeling quite pleased with myself when I jotted down the words 'poetic realism', only to open the booklet accompanying this DVD and find that this very term was the one used by Douglas's lifelong friend Peter Jewell to describe Douglas's work. My pang of disappointment at coming in last soon passed as it occurred to me that I was probably one of many who had done so, and that the process of agreement had thus afforded the term validity. Inference is key to the carefully composed minimalism of Douglas's storytelling, if indeed it can be categorised as storytelling in the traditional sense. Over the course of the three films, Jamie may undergo the sort of transformation almost demanded by standard narrative, but the change is gradual and undramatic and the real pay-off occurs outside of the timeline of the three films and in their production – as Douglas himself once said, it's he himself and the work he produced that provides the Trilogy's happy ending. Douglas clearly had an instinctive understanding of the communicative power of imagery and used framing and mise-en-scène to subtly suggest what could easily have seemed clunky if spelt out through dialogue. Thus we are made aware of the absence of Jamie's dad though the distance the boy places between himself and the coal mine when locals kids come to meet their fathers from work, of the pain caused by his departure by the grandmother's angry spit as she passes his front door, of his inherent weakness by his silent but immediate departure in moments of potential conflict. Similarly austere is Douglas's editing style, which prunes whole sequences down just two or three shots of sometimes non-consecutive action, cut together in a manner that leaves the audience to surmise what took place to get us from A to B. This is no concession to budget or haste but a clear decision to view events as Douglas himself remembers them, stripped to the moments that have stayed with him over the years. Thus when a scene in which when Jamie is given a dressing down by his father's wife (few characters are referred to by name either in the film or the cast list) is followed immediately by one in which Jamie is back in school, we do not need to see his decision to return or the process of doing so. 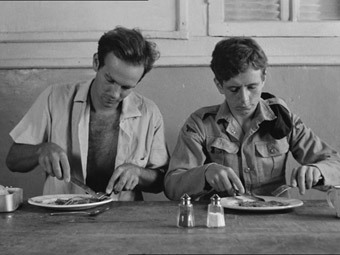 It's an approach employed throughout the Trilogy, most memorably in Jamie's journey from homeless and desperate youngster to Egypt-based conscript: two unfamiliar faces at the doors of his former home and a static shot of an overgrown courtyard give way to the sand-filled view from the back of a transport lorry, held long as two voices hesitantly introduce themselves to each other, a conversation that almost offhandedly establishes their identity and situation. Visually the films are consistently arresting, constructed from compositions that are as purposeful as they are beautiful. Camera movements are rare and traditional editing rhythms are often abandoned, Douglas instead choosing to linger on moments that force us to reflect on the feelings of those caught within his frame. 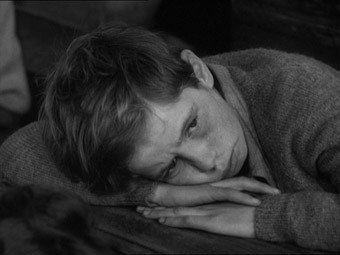 The scene in which Jamie is driven home from school by his father is a prime example of this – having observed the sad-faced figure of the girlfriend sitting to Jamie's left for some time, Douglas then leads us to expect a similar cut-way of the father when Jamie looks in his direction but refrains from supplying it, which has the effect of focussing our attention on Jamie's reaction in a manner that connects us fully with his experience and feelings. The casting is close to perfect, with non-actor Stephen Archibald utterly believable as Jamie, selected by Douglas as someone who understood the character through life experience rather than interpretation. 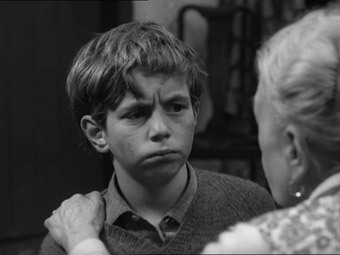 This is not acting for the camera in the traditional sense – it's all in the eyes and the facial expressions and body language, and in spite of (or perhaps because of) Douglas's minimalist approach, it's as real as any child performance you'll find in British cinema. With the auteur theory now out of favour with those who always took it too literally anyway (and yet still eagerly hunt out and champion works by their favourite directors and complain if they don't deliver the expected results), Douglas's extraordinary Trilogy most effectively reminds us of its endearing validity – three films, each with different editors, producers and cinematographers (one of whom, Gale Tattersall, worked again with Douglas on his only feature, Comrades and more recently was nominated for an American Society of Cinematographers award for his work on the US medical series House M.D. ), and yet the vision remains consistent throughout. There is a slight variation in tone to be sure, due in part to the content and how Douglas has elected to portray it, most obviously in the move to Egypt for the second half of My Way Home. My personal favourite of the three remains My Ain Folk for a number of reasons, not least its almost surrealistic moments that visually prefigure the disturbing monochrome family tableaux of David Lynch's Eraserhead, and I don't make that comparison lightly. There's so much to talk about in the tragically cut-short cinema of Bill Douglas (he died of cancer in 1991) that there's a dangerous temptation to endlessly ramble and re-write as you think of another five or six things you feel you should have at least mentioned and preferably discussed in detail. But this is meat for debate between enthusiasts after they've watched the films, analysis of what you've seen and the things you have learned about the characters and their lives, and about filmmaking as a craft and an art. As someone who always prefers working with the widescreen frame, its nice to be intermittently reminded just how effectively an image can be composed for 1.33:1, as well as how beautiful even everyday images can look on black-and-white stock when captured by a cinematographer (or three) worth their salt. Apart from the unexpected but emotive use of colour at the start of My Ain Folk, the images here display a gorgeous monochrome tonal range, from the clear highlights to the rock solid blacks. Grain is more prominent in My Childhood, which I'm guessing was shot on 16mm – detail is good here but improves considerably on the second two films, which appear to have been shot on 35mm. Traces of damage are only really visible in My Childhood, although there is some minor flickering visible on all three, presumably a side-effect of the restoration work. On the whole, though, this is as good as I've seen the films look. There are a couple of noticeably soft shots on My Way Home, but I'm assuming these were down to camera issues rather than momentary blips in the transfer quality. The soundtracks on all three films are Dolby 2.0 mono and in fine shape, being clear and free of hiss and damage and displaying a surprisingly good dynamic range. All of the extra features are on disc 2 of this set. An excellent retrospective documentary tracing the life and career of Bill Douglas, constructed around a smart collection of interviews with those who knew and worked with him, including close friend Peter Jewell, who plays down his contribution to Douglas's work despite the acclaim of others, and actors Phil Davis and Imelda Staunton, who worked with Douglas on Comrades. A fitting tribute that is also fascinating and thorough introduction to Douglas and his work, it clearly illustrates how closely the films mirrored his own life and includes extracts from a rare interview with the director and his graduation short Come Dancing, both of which are also on this disc. The only surviving footage of one of the few filmed interviews with Douglas, conducted by Tom Goodison and recorded for the Westward television arts programme Preview West. Brief though it is, its inclusion is welcome, putting a face and voice to the man and including as it does some revealing info, the choice bits of which were snagged for the documentary above. A young man nips off to Southend for the day and is the subject of what looks to be a gay pick-up in a pier café – one whose proprietor is glued to the TV at the programme of the title – but all is not quite what it seems. Douglas's London Film School graduation project certainly has a film school feel (I've seen a lot of these and even worked on a few), but is an engaging piece with a well done final twist that the above-detailed documentary gives away, so watch this first. A typically excellent accompanying booklet featuring an introduction by Peter Jewell (including the poem he wrote for Douglas to mark the 10th anniversary of his death), essays on the Trilogy by John Caughie and Matthew Flanagan, biographical essays on Bill Douglas by Louise S. Milne and Stephen Archibald by Sean Martin, full credits for all three films, a recollection of the TV interview by Tom Goodison, a piece on Come Dancing by Peter Jewell and details of the transfers. They're not going to be everyone's cup of tea, but I have no problem arguing the case for the Bill Douglas Trilogy as three of the most important British films of the 1970s. Compelling as autobiographical and social documents, it's Douglas's richly textured minimalism that lift the films into the realms of great cinema. This BFI DVD release is as close to definitive as you could want, for the transfers and for the fine support material. Highly recommended.